Screenshot from Going My Way (1962). It is only natural to be curious about the beliefs of someone we admire from afar. We want to know what the person was really like and whether or not we would have anything in common with him/her if we were to know him/her personally. As to the question of Gene Kelly and whether or not he was religious, the short answer is no, but the longer answer is much more complicated. Gene was part of a large “lace curtain” Irish Catholic family . He grew up in the Church and attended a private Catholic school. We can’t know for certain what his beliefs were as a child, but we can surmise that he accepted the teachings of the Church as truth. It wasn’t until Gene took a trip to Mexico in 1939, and witnessed firsthand the poverty of the local people and, in stark contrast, the riches of the Church, that he began to question his faith and its teachings. This, along with other experiences, compelled him to renounce his faith and declare himself an agnostic. Even so, there is evidence that he continued to go to mass on occasion and would defend Catholicism to those who denigrated it. When he moved to New York City shortly thereafter to begin his career on Broadway, he began to socialize with a “free-thinking” intellectual set, and it is doubtful that any ideas he exchanged with them promoted the faith he had learned as a boy. His first wife, Betsy Blair, became part of this set, and after their marriage (in a Catholic church, to appease his mother) they moved to Hollywood, where they continued to socialize with like-minded people. After their daughter Kerry was born, Gene and Betsy made an effort to bring her to church, but only when his mother was in town. They taught her Catholic prayers, but only shortly before a visit from Mrs. Kelly. When the family visited Rome, they sought a blessing from the Pope for Gene’s mother. Gene was clearly anxious to make “Mom Kelly” happy, even if it meant keeping up false appearances. When he had only himself to consider, he tended to avoid such hypocrisy. 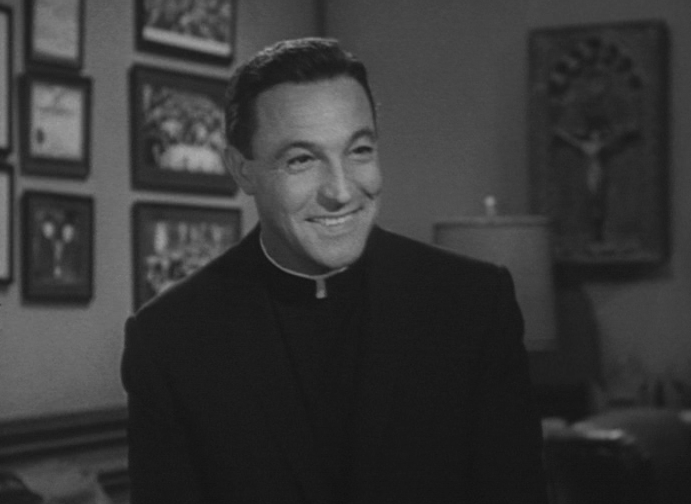 During a frightening plane ride, when there was genuine fear that the plane might crash, Gene momentarily considered praying to God, but decided that he couldn’t be a “death-bed Catholic and a coward.” Thankfully, a tragedy was averted and Gene lived almost 40 more years, during which time he portrayed a Catholic priest in the 1962-63 television series Going My Way (above). We don’t know if he ever fully committed one way or the other, but there is little evidence to suggest that he was a “vocal atheist,” as his Wikipedia entry states. “Lace curtain” is a term used to describe Irish immigrants who were generally poorer than their (usually Protestant) neighbors, but who aspired to prosperity. Yudkoff, Alvin. Gene Kelly: A Life of Dance and Dreams. New York: Billboard Books, 2001.